When my daughter, was 2 years and 6 months old, I went through a divorce. We left and stayed in a one bedroom granny flat, which was the first and best I could afford at that time, to start a new life, together with my daughter. That first year was really tough and it didn’t help that there were no single-mom role models in my life, I kept telling myself, this won’t last forever. If so many other women can do it, I can surely do it too. Fortunately, I had a fantastic group of friends and family who helped. Maybe none of them knew exactly what I was going through, but they supported financially, emotionally and showered my daughter and I with love, which I appreciate to this day. After some time, I got back on my feet and with the help of my loving parents, I was able to buy a bigger place of my own. A place where my daughter and I could build a new life for ourselves. I dreamt for so long about giving her a room of her own. Finally, a place that we can call our home, where we feel safe and can invite friends and family over. Something not a lot of single mums have, and there are a lot of single mums out there. It is no surprise that children spend a lot of time in their bedroom, for sleeping, playing and reading. It follows that their space should be a reflection of their little personalities. 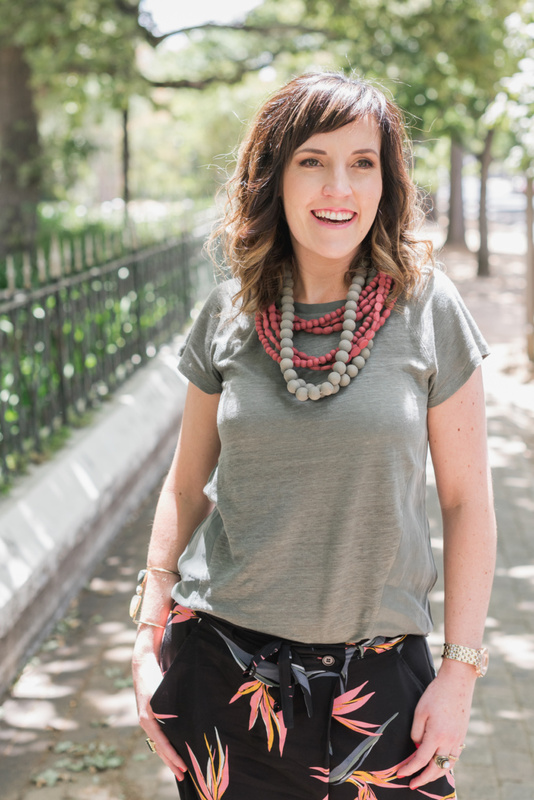 I wanted to create a look that is stylish, practical, fun, cosy and comfortable, where she could release her inner child. My little girls had grown into a toddler and desperately wanted a place of her own that reflected who she really is. I didn’t have the money to really decorate her room, but at least she had a bed to sleep on and a bedside table for her night light, as starting to sleep in her own room, was a big adjustment for her. I chose a natural, but modern grey colour for the walls of our house, as I thought it is in style and about any colour goes nicely with it. I asked her which colours she would like in her room and of course, the answer was pink with animals, her favourites. Although paint is the easiest, cheapest way to brighten a child’s room, I decided to keep the walls the light grey colour and rather incorporate colour in other fun ways through bedding, rugs, scatter cushions and wall décor. I’m not a big fan of bright colours and Disney themes, so I decided to use bunnies and stars and to incorporate a light pink, white and gold to give it a girly touch. I learnt that when furnishing a small room, you have to limit your palette of colours and materials – using too many will visually clutter a room and make it feel much smaller. The saying “less is more” is so true! I wanted to ensure my little one would have nothing but sweet dreams as she is tucked into a fabulous bed each night. It’s no secret that sometimes putting them to bed can be a challenge, so the more appealing you make slumber time, the better. As her room is quite small I opted for a reversible grey/lilac Seascapes duvet set by Bunni. I added a giant fluffy cloud, ivory moon and furry star scatter and cushions to bling up her bedroom to create a gorgeous look. These beautiful scatters would surely make a big impact in my daughter’s room and her friends would be queuing up for sleepovers. 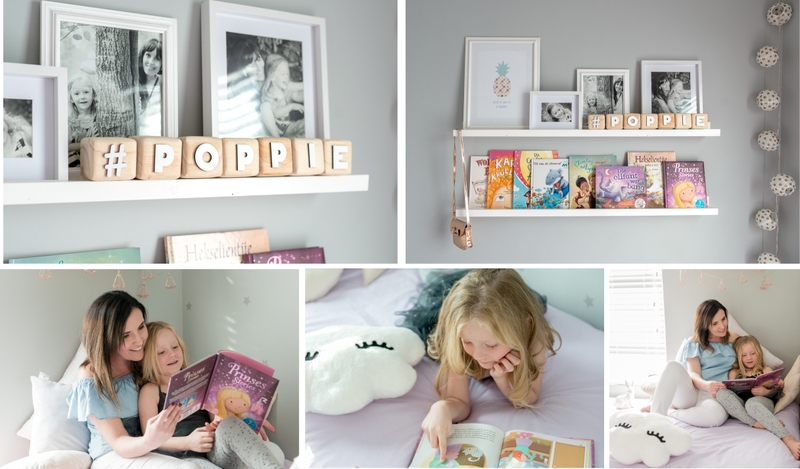 The leather strap wall shelf is perfect for storing toys and books, and she can accessorise it with her own items. This is a great way to display awards, trophies, collectibles, toys or stuffed animals. With its toned leather and wood combination, this product makes for an authentic scandi-style look and feel. It’s available in various sizes and it creates a minimalist display feature in narrow spaces or can be used in other wide open areas in your home. My tips for decorating a children’s bedroom would be to remember that fairy lights are not just for Christmas – to use them in a child’s room to create a dreamy atmosphere and to not be afraid to mix vintage and contemporary styles. I used a string of white with gold dots paper lanterns rose gold geometric shaped lights that are just bright enough to cast away any fears or danger whilst being soothing enough to sleep comfortably. We only use the bedside lamp for reading at bedtime. One of the hardest things of being a single mother is not having her with me every night, as we follow a 50/50 schedule. Another thing my little girl can’t go to bed without is her bottle of cold water. Her white and wooden finish bedside table is positioned conveniently and provides a comforting space for her bedside light, her drink, a drawer and storage below for her toys. Next, the grey/silver vinyl wall stickers are a great addition. They are easier, quicker and cheaper to use than wallpaper. Little dots, triangles, arrows or clouds are just some of the many choices available. As our walls are a neutral grey, it creates the perfect canvas for the pops of colour or allows for an easy makeover by changing the soft furnishings. Don’t let their diminutive size put you off. What small bedrooms lack in space, they can more than make up for in charm and atmosphere. Learn to work with awkward corners and strangely positioned windows, and a small bedroom can become more characterful than most large rooms ever could, giving you the most out of even the tiniest space. Making storage fun is also important by using cleverly shaped boxes, baskets, side tables and shelves. Make storage practical, accessible and easy to use, so that children have a place where everything goes. A natural belly basket is ideal for toys and these are also very useful in and around the home. The easy to reach storage items make it easy to tidy up and keep things in their place. From the moment they’re born, kids begin to accumulate a lot of stuff. Storage is crucial and, believe it or not, implementing it in creative ways can make all the difference to the look of your kid’s bedroom. I encourage my daughter to have an input into her colour scheme and theme, she bought into the idea of the room from the start and had a hand in how it was planned and arranged, as I hoped she would be more likely to take pride in keeping it organised and tidy. My little one absolutely loves reading and can’t fall asleep without me reading at least 2 storybooks to her at bedtime. I wanted to create a reading corner or nook in her room, but as her room is quite small, I didn’t want it to take up too much play space. I decided on a hand-made white wall mounted display shelf, to make her room feel bigger – it’s all about being able to see under and around things that trick the eye into thinking a space is bigger than it really is. Of course, her grandpa played a big role in the making and fitting of the shelves. These shelves provide a perfect space for her own favourite books as well as the books we take out at the public library. Yes, old school I know, but she likes variety and who can afford to buy new books all the time. I added #poppie in these solid wood block letters to add some decoration. You can use them to write your little one’s name or a special message in their room or nursery. Since they are lightweight enough to play with, why not get the whole alphabet so baby can start to learn to spell from an early age? The beautiful 100% cotton, machine washable pink dotty rug by Lorena Canals rug, will make for a luxurious addition to any bedroom or playroom. The design has been created to add a complimentary focal point to a room whilst creating a luxuriously soft area for your child to relax or play on. Children spend most of their time on the floor of their bedroom and this rug will ensure that they do so in comfort. Plenty of floor space allows for freedom to move, play and imagine, and the bed creates a creative space within a space where dreams are made. I added a few accessories like this sweet gold foil pineapple print . I also just couldn’t resist this wall quote saying, “Be bright, be happy, be you”…exactly what my wish is for my daughter. I used the wall book shelves to hang her favourite ballet dress , just a few of these added to a room will take it from bland to bright. I looked high and low for a beautiful coloured natural wooden toy and loved the Mumu & Me Shape sorting wooden toy that keeps kids dreamily busy for hours. Whatever you do with your children’s bedrooms, if you involve them in the planning process, then encourage their participation in the execution of the updates to help make their bedrooms feel even more like their own private space. Kids are a great joy of family life, but one thing that can be difficult is decorating a bedroom of someone that grows so quickly before your eyes! I’m not really big on gender neutral designs but I did try to decorate in such a way that it can easily be changed into a boys room in the future. My top tip for decorating kids bedrooms is to maximise storage and to keep things simple, kids change their minds and get bored of a lot of things very quickly, we’ve all been there! Children’s bedrooms should be fun, bold and playful. Next post: Is co-sleeping a good idea? Love your strength through it all. Glad you and your daughter have a better life now 🙂 Btw, Your color scheme and choice of accessories are exactly what I’m currently incorporating into my 3 year old’s bedroom which we’re slowly but surely building 🙂 All the best! Loving mother of 5-year-old daughter. Owner of Social Media Marketing agency, Pretty Social. Social Media junkie, Coffee lover, love the outdoors, spending time with family and friends, passionate single mother and crazy about all things pretty!